The sun is shining, the sky is blue, wood frogs are singing love songs in the pond, and the last bit of snow on our property melted this afternoon. Life is good. Today’s good fortune follows yesterday’s happy evening spent with life-long friends. The food was excellent; the conversation even better (except, perhaps, when I was motor-mouthing). Ali and Tissy made richly delicious Salmon Chowder, using wild Alaska salmon. Moira and Jake oven-roasted vegetables, always a treat. Teeny made her famous wild blueberry pies with berries she foraged and froze last summer. I took advantage of asparagus flooding local markets to make seasonally fresh Asparagus Pistachio Pesto sauce for pasta. I was inspired to create pesto with asparagus by my recent success with Lime, Cilantro & Edamame Spread, one of the tastiest things I’ve made all year. If edamame beans worked for pesto, I thought, why not asparagus? Asparagus Pistachio Pesto was a resounding success. Lemon balanced the sweetness of asparagus, pistachios enhanced its nutty flavor, parmesan added richness, and garlic and mint downplayed asparagus’s grassiness without overpowering its spring green freshness. Even 2-year-old Maggie was a fan! Asparagus Pistachio Pesto is quite versatile. It’s perfect for pasta, but would also be good with boiled potatoes, sautéed vegetables, grilled/pan-fried seafood, poultry, sandwiches, and countless other partners. Roasting or grilling asparagus adds depth to pesto’s flavor, but you may instead blanch the asparagus for 2-3 minutes in boiling, salted water, and then cool it quickly in cold water. To speed things up, on a day when you’re grilling and have a hot fire, grill asparagus and save it to make Asparagus Pistachio Pesto the next day. Pesto may also be made ahead; if you do, leave out the lemon juice and mix it in just before serving; this helps preserve pesto’s lovely green color. To add richness and crunch, pistachios are used in both the pesto and as a garnish, for a total of 1/2 cup plus 2 tablespoons nuts. If you don’t have pistachios, pine nuts make a fine substitute. Parmigiano Reggiano is the best quality of “parmesan” cheese available; I like using it (and best quality extra virgin olive oil) in uncooked sauces where the flavors of individual ingredients really make a difference in the finished dish. However, any cheese suitable for grating may be substituted for Parmigiano Reggiano. (In Anchorage, Costco sells reasonably priced Parmigiano Reggiano.) I list the amount of cheese in ounces because 1 ounce of cheese can measure 1/4 cup or 3/4 cup depending on the type of grater used. If you can’t measure cheese by weight, add a little at a time to the processor bowl until there’s enough to richly flavor the pesto, but not enough to overpower the asparagus. Precook the Asparagus: For grilling, heat the grill to high. For oven-roasting, preheat the oven to 510°F (if your oven doesn’t go that high, preheat it as high as your oven goes); put in a baking sheet to preheat with the oven. Snap woody ends off asparagus. Toss asparagus with olive oil and season with salt and freshly ground black pepper. Cook asparagus until just barely tender, about 4 minutes on the grill and about 5 minutes on the preheated baking sheet in the oven. If using oven, when asparagus is done, take it off baking sheet immediately after removing it from oven. Cut tips off asparagus and reserve for garnish. Cut asparagus stalks into 1”lengths. Make the Pesto: Put asparagus stalks in food processor bowl. Add pistachios, cheese, olive oil, garlic, mint, salt, lemon peel, and 2 Tbsp. lemon juice (if making pesto ahead, don’t add lemon juice until final assembly to preserve pesto’s color). Process until the ingredients are thoroughly combined, being sure to scrape down the bowl’s sides from time to time. Taste and add lemon juice, as needed. Cook the Pasta and Assemble: Put a large pot of well-salted water over high heat until it’s rapidly boiling. Add the pasta and give it a stir to make sure pasta isn’t sticking to the pot’s bottom. Cook just until pasta is al dente. Reserve 1 cup of pasta cooking water. Drain pasta. Stir together cooked pasta, prepared pesto, and 1/2 cup of pasta cooking water until ingredients are well combined (add lemon juice if it wasn’t previously added to pesto). If the mixture is too thick, add the remaining pasta cooking water, as needed. Taste and add salt, freshly ground black pepper, or lemon juice, as needed. Top with reserved asparagus tips and pistachio nuts; toss lightly. Serve with bowl of freshly grated Parmigiano Reggiano cheese on the side. NOTE: To toast raw pistachio nuts, put them on a baking sheet in a preheated 325°F oven for 6-8 minutes, watching carefully to make sure they don’t burn. Take pistachios off baking sheet as soon as you remove it from oven. This is my entry for Weekend Herb Blogging, hosted this week Marija from Palachinka. I made some asparagus pesto not long ago Laurie and stuffed it into sandwiches, chicken and pasta. It is so good isn't it!!! A great variation on the usual pesto. Thanks Laurie! asparagus stalks, the kind that are commonly known in the cooking world, were once an expensive import to cretan supermarkets - approx. 8 euro a kilo, and they came from peru! 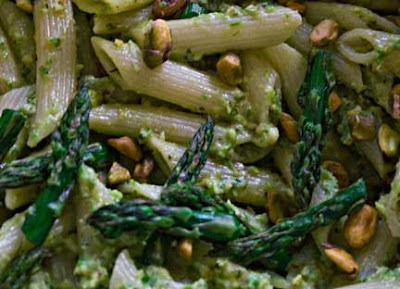 I've never tried asparagus pesto but it makes sense and looks delicious. I especially like the pairing of pistachios for this pesto. Very nice. I'm one of Laurie's testers, and I have to say I agree with Little Maggie - this wasn't just good, it was exceptional. I'm intrigued by this pesto recipe Laurie! Asparagus is not my favourite vegetable but I still eat it on occasion. I can only imagine what flavour the addition of garlic, cheese, mint, lemon peel and pistachios does to the pesto. Must remember to pick up some asparagus soon! Oh how I've missed your wonderful recipes! This looks amazingly tasty Laurie and very spring-like. Love the pairing of asparagus and pistachios...so perfect! What a great use of asparagus. I am always looking for ways to use them in a different way (usually we have them steamed with olive oil and lemon dressing). I love the idea of combining it with pistachios (my favorite nuts). what a great dish for pistachios! This looks superb Laurie! I love the pistachios in the pesto. I made one around Easter using pecans and parsley but I felt it a bit "heavy" and think the pistachios will work much better. I've just tasted asparagus a month ago for the first time :) Collecting the recipes now :) this one sounds great! Thanks for sending it to whb. Looks excellent. The pesto and pistachio combination is brilliant. Pistachio gives such a wonderful flavor to pesto! I love that you used asparagus as well...your evening with your friends sounds like so much fun! Once again happy to meet you..
Laurie, I've made the asparagus pesto twice now and it is amazing!! Such a delicious way to eat asparagus. Thank you for posting this! Bijoux - So glad you like it!!! Thanks for letting me know. Laurie Helen Constantino and her husband have homes in Anchorage, Alaska, and on a rural Greek island. In both kitchens, the foods of the Mediterranean play a starring role. 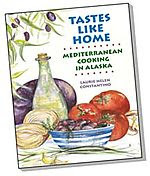 Laurie's cookbook, Tastes Like Home: Mediterranean Cooking in Alaska, was published in 2007. Laurie's photographs are featured on her blog Picturing Anchorage (www.picturinganchorage.wordpress.com), where she also writes about city walks, trail walks, and interesting events in Anchorage, Alaska's largest city. All writing and photography on Mediterranean Cooking in Alaska is Copyright Laurie Helen Constantino © 2007 - 2010 unless indicated otherwise. All rights reserved.